Fly the perfect holding pattern, every time! Holding Pattern Computer makes it easy for the student pilot and seasoned pilots alike solve the most common planning and navigating problems related to flying a holding pattern. This is the finest, most advanced Holding Pattern Computer available today. It not only shows which entry procedure is appropriate, it also helps the pilot remain mentally oriented to the aircraft's relative position to the pattern, to magnetic north, and to any effects of wind. 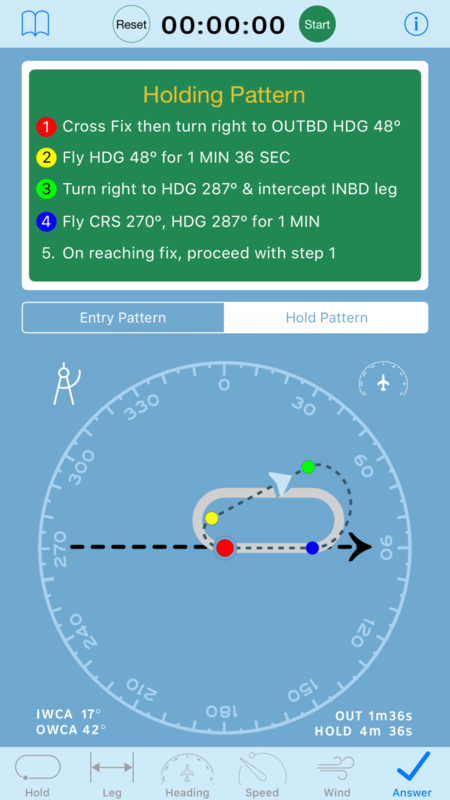 Whereas other holding pattern apps and training devices simply suggest an appropriate entry procedure, direct, parallel or teardrop, this Holding Pattern Computer takes it a step further and provides turn-by-turn directions, including how long to fly a heading before initiating a turn, and not just standard rate turns with bank limitations (30° manual flying and 25° with a Flight Director) but arbitrary turn rates too! 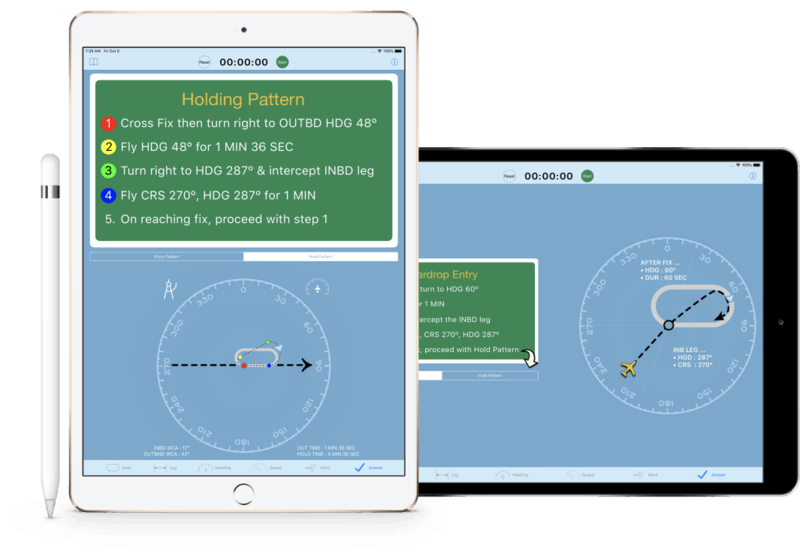 This app takes a step-by-step approach when entering holding data, using individual screens for each component which makes it much easier to focus on one element at a time while continuing to fly the airplane. The app consists of six tabs, each representing a data input screen. To switch to a different input screen, tap on one of these tabs located at the bottom of the screen. 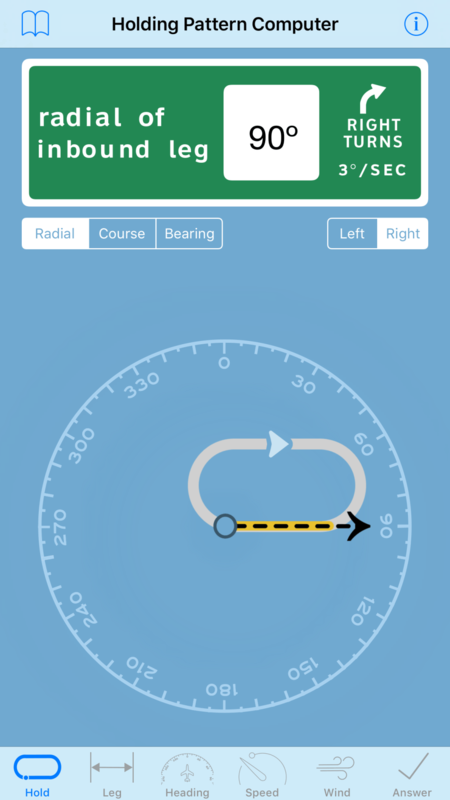 The hold screen allows you to set the inbound radial, course or bearing to the fix and to set if the turns in the holding pattern are standard right-hand turns or non-standard left-hand turns. Entering information is easy. To enter the heading of the inbound leg, tap one of the buttons titled Radial, Course, or Bearing. Then, tap on the white box at the top of the screen displaying the degree value to display an on-screen numeric keyboard, or you can rotate the dial in the middle of the screen using your finger. 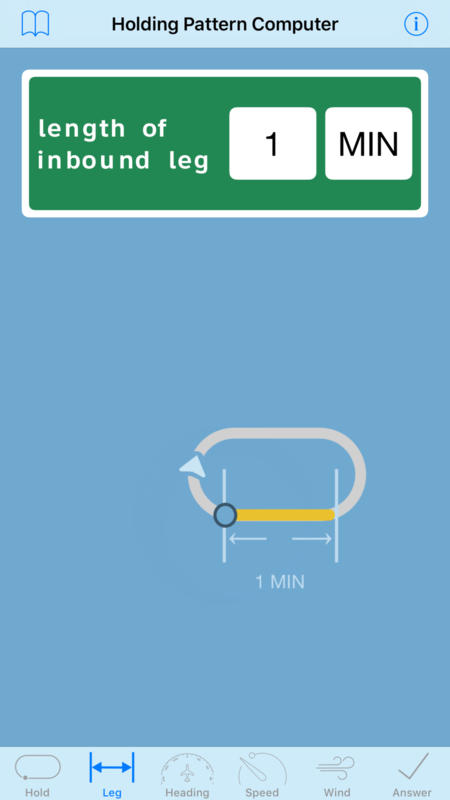 Next, set the turn direction by tapping one of the buttons titled Left or Right. 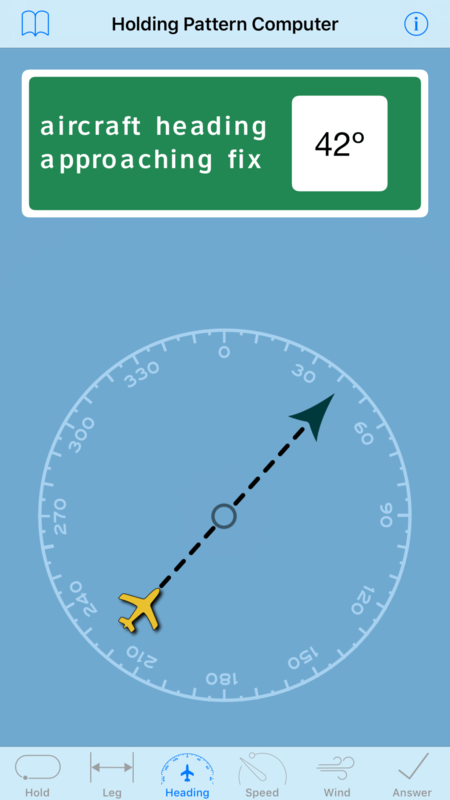 If you are using a flight director, or if you wish to use a turn rate other than the standard 3° per second, tap the area of the screen that displays the left or right arrow. You can enter a custom turn rate, or use the standard of 3° per second. If a standard rate turn is selected, the bank angle will be limited to a maximum of 30° when manually flying and 25° with the use of a flight director. When the bank angle is limited, the rate of turn corresponding to the bank angle limit will be displayed under the Left or Right Turns Arrow. This screen is where you define the length of the inbound leg. 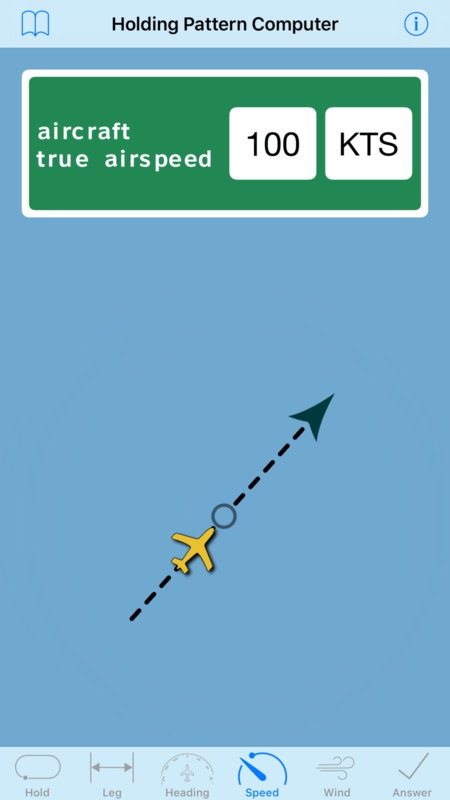 This screen allows you to set the heading of your aircraft approaching the fix. The computer will use this value to determine the recommended Entry Procedure for the hold and to guide your turns further. You can change the value displayed in the heading field by tapping it to display an on-screen keyboard. You can also change the heading value by rotating the heading dial using your finger. Use this screen to enter the aircraft true airspeed. Along with wind data, the computer uses your true airspeed to determine your ground speed, wind correction angles, and the perfect length and heading of the outbound leg. With our wind correction calculation, you can fly an outbound leg that will enable you to intercept the inbound leg with a neat standard-rate turn, or custom rate - every time! The "Entry Pattern" sub-tab on the answer screen graphically depicts the recommended Entry Procedure and lists the steps necessary to fly it. 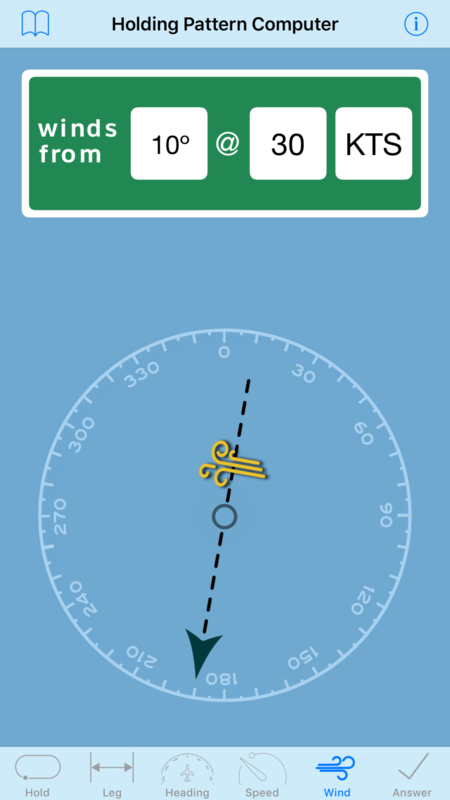 Additionally, the computer calculates which way to turn, left or right, which course and heading to maintain, and how long to fly a heading before initiating a turn. 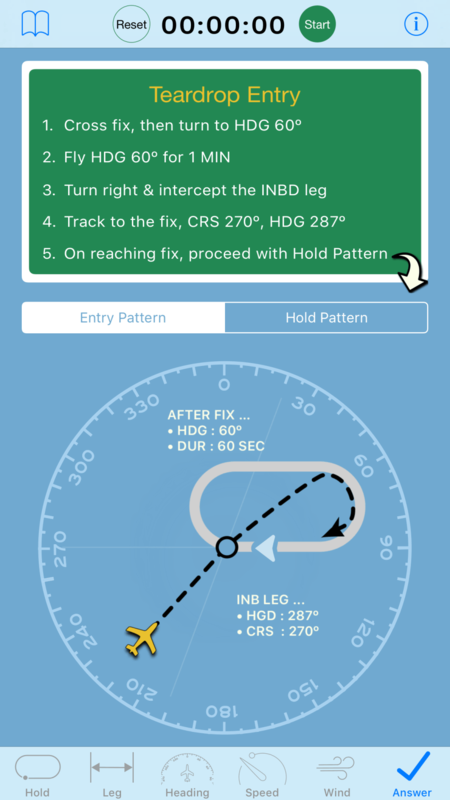 The "Hold Pattern" tab on the answer screen graphically depicts the calculated Holding Procedure and lists the steps necessary to fly it. The holding pattern computer calculates which way to turn, left or right, which course and heading to maintain, and how long to fly a heading before initiating a turn. The shape of the holding pattern depicted on this screen is derived from a completely analytic solution, rather than rule-of-thumb formulas, and is more accurate than the recommendations found in the Airman Information Manual, especially when in the presence of strong winds. You can find a detailed explanation of the equations used within this application and why this solution is better at http://www.BetterHolds.com. 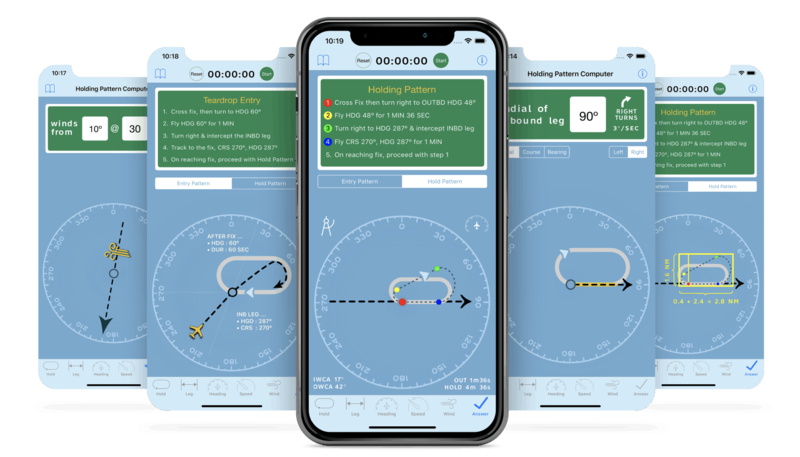 We've also included a built-in timer, an onboard user guide, and the seminal paper: "A Treatise on the Holding Pattern: Expelling the Myths and Misconceptions of Timing and Wind Correction." A convenient count-up timer is located at the top of the entry and holding pattern screens. Built-in comprehensive step-by-step user guide explains how to use every function of the app. A detailed technical paper that explains all the math of our exact analytic solution. For less than the cost of one hour with a flight instructor, you're getting the most advanced Holding Pattern Computer available and the information needed to help you master and fly the perfect holding pattern, every time!